Perhaps you've just taken our personality test and discovered that you are an ENTP. Perhaps you've heard about the cognitive functions and are curious to learn more. Well, you're in luck. Neojungian Academy is an actual academy. We have actual courses on everything you read about. We offer certificates and diplomas so that you can track and add your knowledge to your resume. Are you ready to get started? Neojungian Academy is founded on Carl Jungs theories on personality and psychology. His theories have now been proven thanks to new research in neuroscience. We now have the scientific and theoretical base for sixteen personality types. Every type has a set combination of mental networks that they prefer to use. But you use all of them - to some extent - and under certain conditions. Match the letters in your type with the above picture to find out which network you use the most! Which of the following is a trait in Neojungian typology? Carl Jungs theories on human behavior are still used all over the world. But there are three major criticism to most existing models based on Carl Jung. 1. Jungian theories lack a strong scientific backing. Through neuroscience, we have been able to find scientific support for all dimensions Carl Jung believed to exist. We have found six networks in neuroscience that directly describe the processes that Carl Jung theorised would exist. We are the first to give you the real - science verified story. 2. Jungian personality tests lack statistical validity. The neojungian personality test has with over 20,000 test-takers confirmed over and over that the dimensions we measure for not only have scientific backing, but can be tested and measured accurately through self-assessments. We believe our tool to be one of the most consistent and accurate personality tests available. 3. Jungian personality types "box people in." Neojungian typology redefines personality from "your observed behavior" to who you are when you are in a state of flow. To us, the personality traits we measure are about your basic emotional and instinctual tendencies, how your genes pull and influence your behavior. But this is a soft influence, and as such, we don't believe people fall into sixteen tight-knit boxes. Revised frequently to stay up to date with the latest research. Neojungians personality test is always correct. Only for psychologists and scientists. Based on statistics and feedback from more than 20,000 test-takers. In Neojungian, the ENFP personality type is healthy and happy when they use their top four functions. But sometimes, their behavior changes. Stress can make you, while motivated, experience various health and energy related issues. An ENFPs behavior changes during stress, from an ENFP, to an ENfp. Similarly, neuroticism and emotional turbulence can impact you negatively, making you lose touch with your intuition, making you more reserved. This is all driven by neurotransmitters in your brain, for example dopamine and serotonin. Because you know your neojungian personality type you can pinpoint positive, healthy habits, and how to remain motivated and centered. You can learn to recognize the influence of stress and emotional insecurities and you can become more self-aware and positive. Your personality type has little to do with your skills and what you have learnt to be good at. A feeling type can be a highly skilled scientist, and a thinking type can become a great psychologist. An intuitive can work in a sensing environment, and a sensor can have great ideas. For us, what you love comes first. How does a neojungian understand personality? Your personality is what you are skilled at doing. Your personality is about what you love to do. Your personality reflects where you work or what you do. Your personality is what your friends or family think you are. How does Neojungian Typology study personality types? As how to make you more healthy and motivated. As who you are in a group. As how to be more like society wants you to be. As how you generally behave and act. 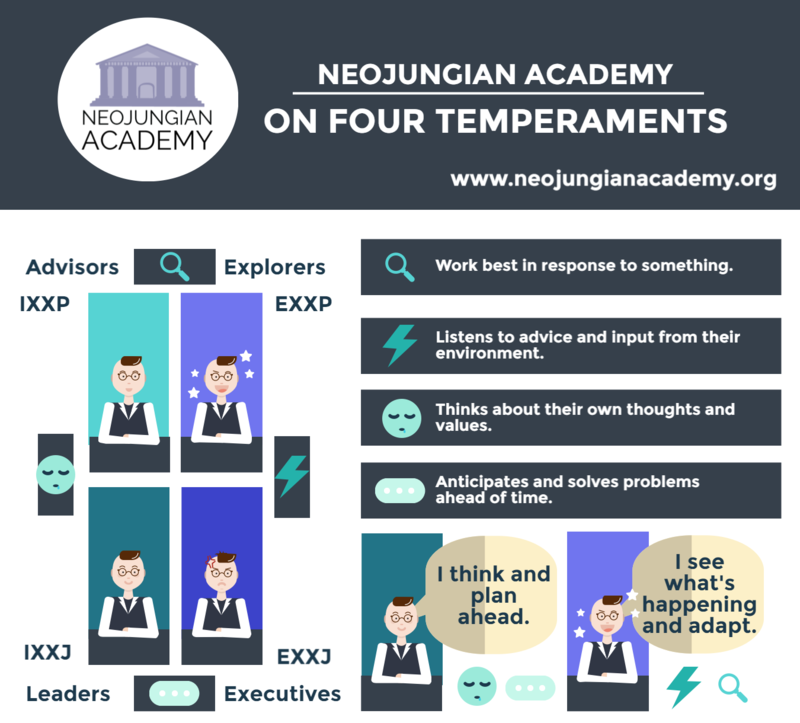 Why do Neojungians study personality psychology? Knowledge about your personality can be used to think back on your life and your conflicts and difficulties in school and at work. It can help you learn more about why you chose to respond as you did and to become more aware of your tendencies and needs. 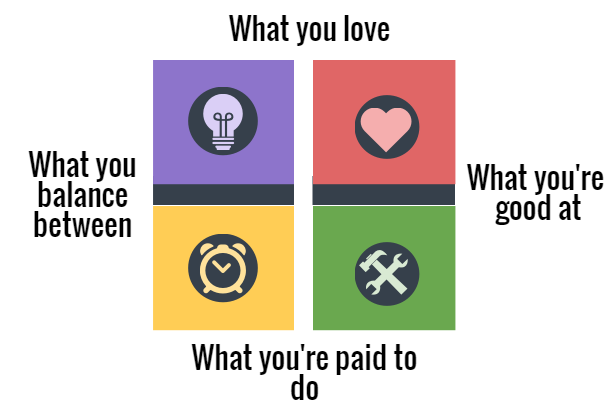 Thinking about it: does your career you picked really fit your needs and your passions? Is there a way you could improve your situation to enjoy life better? Learning about personality is like opening up a dialogue or conversation topic you have never been able to explore before. You can finally talk about yourself and others around you and how they are compared to you. And that’s so much fun. Ideally, using the Neojungian system, you will become more confident about your needs and values, and you will be able to build an environment and relationships better suited for your needs. The goal of Neojungian and, really, all human sciences, is to help humanity thrive. Beyond just learning about yourself, millions of people could benefit from becoming more aware of how the people around them work and think. We still have a lot to learn before we can work comfortably in teams and workplace, while acknowledging our unique differences. And there is much merit in becoming more accepting of differences and promoting personality diversity in our groups. People who study personality psychology ideally become more emotionally mature and more accepting. So if you want that, give it a try. Which of these is NOT an advantage of personality psychology? You can learn more about yourself and your friends. You can start discussing your personality with friends, colleagues and family. You can create an environment better suited to your needs. You can become more judgmental of people who aren’t like you. Your result will give you a code of four letters - INFJ, or ESTP? These are two of the sixteen basic types. Let's compare them. ENTP stands for extroverted, intuitive, thinking perceiver. ISFJ stands for Introverted Sensing Feeling Judger. Hard to remember? Don't worry, we'll help you get the hang of it. Questions: What does ENTP stand for? Imagine you had a kid, and you wanted to know if this kid was more introverted or extroverted. Then you should know that in general, introverted kids are more cautious and more worried about negative feedback, while extroverts are more daring and explorative. Why? What it comes down to is warning signals in the brain. Introverts generate more warning signals, and the warning signals get them to disconnect from others, to read, think, contemplate their experience. Warning signals in the brain drive introverts to use the subjective network. Warning signals tell introverts they can't trust information in their environment. Because extroverts don't generate as many of these warning signals, they can remain in approach-mode. Open to others feedback, studying their environment, finding answers and solutions to problems in the moment, as they're on the move, or through conversation. Extroverts use the objective network. They're more likely to act on reflex or impulse, and more open to suggestions from others. Extroverts are more likely to trust information from their environment. What is the core of introversion and extroversion? If you regain energy more when alone or with friends. Extroverts are better problem-solvers than introverts. Extroverts are more dramatic than introverts. Introverts are more likely to doubt new information. The story mode creates and defines your experiences and your ideas as an elaborate story. Filling your life with adjectives, it paints your experiences. 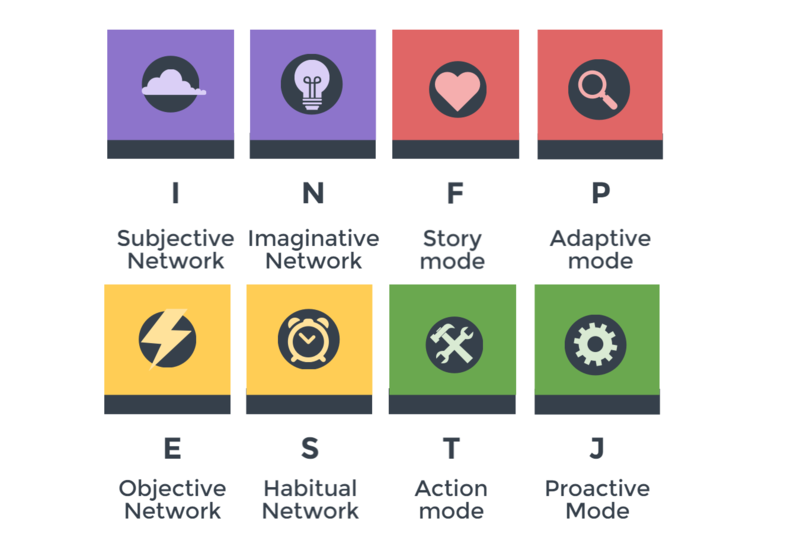 Good, bad, ugly, warm, the story mode network is responsible for your ability to see life as an adventure, an experience, or a chapter in a book. The story mode network is about valuing your experiences. What does this mean to me - personally? The story mode is a subjective way of describing life. The best thing about the story mode is you use it whenever you aren't actively aware of your decisions. Feelers let their minds wander and use metaphores and images to understand life. It does not mean the same to everyone, and that is okay. You can use this complex, social information to perform many complex actions. Your body moves and adjusts to how you are experiencing a situation. You make decisions automatically based on your values and ethics. The action mode defines and describes your experiences and your ideas by their properties. How tall are you? How loud is it? What color is it? When in action mode, your mind is focused. You're actively focusing your mental resources to an activity. You're conscious about your actions, how you move your body, how you breathe. It all happens manually. The action mode is about valuing an experience by it's objective properties. Which salary is the highest? Which product is the cheapest? Which phone is the most recent? Questions: Which of the following statements is always true? Thinkers are more intelligent than Feelers. Feelers are more emotionally aware than Thinkers. Feelers should not be programmers or mechanics. Feeling types tend to enjoy thinking about aesthetics. Thinking types tend to enjoy thinking about how to improve efficiency. Feeling types prefer to just let their minds wander. Thinking types are better dancers. Imagination can be focused to envisioning a red polar bear, or a purple one dancing salsa. But it can also be activated in daydreaming, just letting your mind wander, seeing what images pop up in your head. Intuitive types use the imagination network because their mind is instinctively bored by repetition. Habits and traditions bore their minds. Intuitives prefer alternative routes, new ways, and unusual patterns. They think of these alternative ways by using the imagination network. It fills them with ideas that they relate to about how they envision the world differently. Sensors prefer repetition and tradition. They like when patterns repeat themselves. They like follow-through, habits, organization. The habitual network helps them remember the traditional methods. Their main interest is the usual way to do things. The proven way, that history has shown them works. Sensors prefer organization and when things make sense. They prefer to make things concrete, real, and clear. By doing the same thing over and over, they simplify learning, and remember things more accurately. An intuitive is more likely to Disregard traditional meanings.Stick to traditional meanings. . Sensors tend to be More likely to build and follow habits.More likely to change and modify habits. compared to intuitives. When you are focused on output and creating new things, you're using your judging functions. Judgers think ahead, about what's going to happen. They project and estimate and they approach and they initiate conversation topics. Judgers try to plan in advance. The goal is to course a path forward, to see how things develop. Judgers literally create something out of nothing. They set conversation topics. They initiate discussions. But they don't always win them. The Adaptive types are reactive, and this is not a bad thing. A reactive type responds to others. They give input on conversation topics. They test your work to see if it works properly. They respond to new content and determine it's value. To enter adaptive mode, we need to consider a conversation topic, a piece of work, or a plan. The adaptive mode is used to test that this plan makes sense - this is not just mad random scribblings, but this actually makes sense. The adaptive mode can also be highly creative - how would this plan work in this situation, what about if it rained? The ability to see possibilities in response to a calendar, plan, or goal, comes from the adaptive mode. What do we need to use the adaptable mode? Thanks to the intuitive imagination network, we are able to consciously experience life as an adventure, as something new unfolding before us. We can experience and appreciate change. We can feel a thirst to rebel against the old, and to create something new. And thanks to feeling, we can understand the concept of ethics, beauty, good and bad, and our personal relationship to the world. Thanks to the sensing habitual network, we can understand the concept of duty. What is the natural order of the world? What is the usual way of things? What happens if we don't follow our given roles and traditions? Sensing makes us think more realistically. Finally, thinking connects us to our need for efficiency, objectivity, and reason. What is my status in the group? What am I capable of? What are my strengths and weaknesses? You are an idealist, you’re a dreamer, a free spirit, and an imaginative person. You enjoy to just let your mind wander and to act on feelings and beliefs. As an NF, you enjoy to devote time to developing your creativity and exploring your curiosity. Your ideas and the things you study often tend to lack immediate practical implication, but that’s not why you explore things. You explore things as your primary form of recreation, for fun, finding things that are beautiful, interesting, and that resonate with you and your own identity. The NF – the idealist, possess the gift of true – open – creativity, creativity without any boundaries. You can either think of the solution to world peace, recipes for Thai Mexican fusion, or theories for why stars are born while you are doing something completely mundane at work. Idealists have creativity free from time and space – you think of inventions already invented, inventions that won’t be realized until three hundred years in the future. You’re often interested in existentialism, philosophy, and ethics. The questions you consider are often open ended and full of meaning and depth. You’re interested in the hidden motives behind what people say, the true intentions to people’s actions, and what drives people’s behaviour. NFs are in many ways true humanitarians. But NFs can sometimes struggle with folly and ignorance. You don’t always know what is the right answer, and to pretend that you do know is folly. Try to practice humility and let others know that you don’t know for sure. You are a rationalist, you’re creative, free-spirited and progressive. You enjoy to focus your creativity on real world problems, finding novel and unique solutions in science, work, and technology. As an NT, you enjoy to devote time to developing your creativity and exploring your curiosity. While you love to think creatively, it’s important to you to employ reason and objectivity to control the scope of your creativity. You want to use your creativity in an efficient manner, by fixing measurable problems, and coming up with unique solutions. 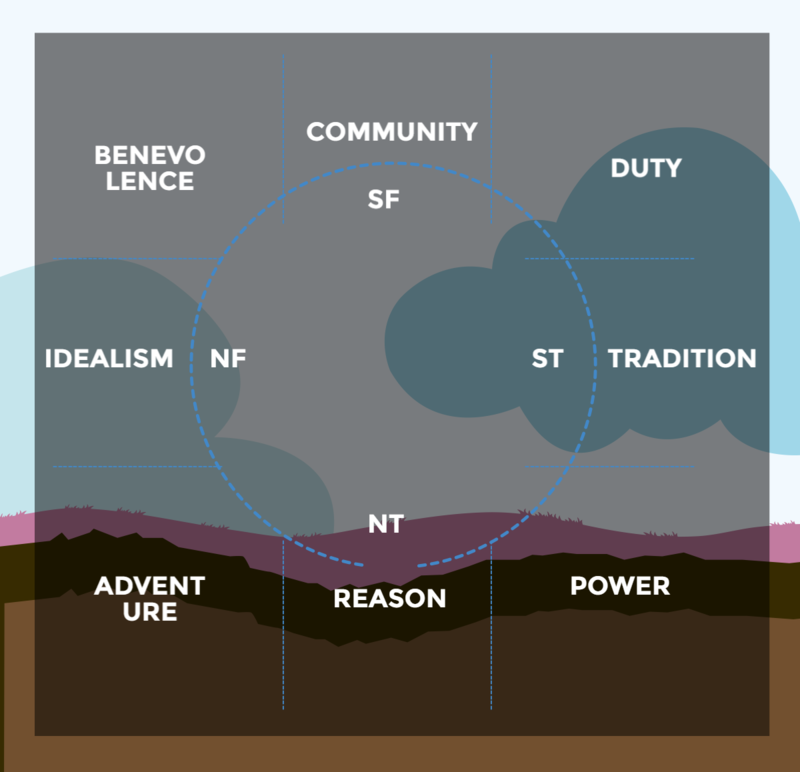 The NT – the rationalist, possess the gift of focused and rational creativity. You enjoy to employ your imagination and your wit to think up solutions to any problem consciously, the only limit is your passion and your intelligence. You’re focused and mentally aware of the here and now, your breath, your actions, and your thoughts, and you can direct them as you see fit, all depending on your interests. You’re interested in the hidden functions of technology, what makes people tick, how the world works, the social games and rules, and how you can come out on top of it all. But you need structure to truly employ your mental resources – when you don’t have any system or logic to direct your thoughts, it becomes all the more difficult to decide what the next step is. And it can be difficult at times as an NT to admit to ignorance. You don’t always know the right answer to all questions. At those times, don’t be afraid to admit to folly. Practice humility and remember that admitting that you know nothing can be the start to new opportunities to learn. The SF – the communitarian, has the gift of being a present-minded free spirit, acting freely, in touch with who you are, and honouring your role in the society. You’re interested in being healthy, safe, and in touch with your family and your social roots. You’re interested in social consistency, living up to and honouring your beliefs and your identity every day, finding out and letting people know who you are and what you believe in. You’re concrete, direct and simple in your needs and expectations. But as a communitarian, it can be hard to deal with guilt. Sometimes you fail to live up to others expectations, and sometimes you don’t always do the right thing. It’s important to remember at those times that nobody is perfect. Let people know when you’re struggling, and let other people help you like you help them. You are a traditionalist, you’re reliable, safe and duty oriented. You pride yourself on being responsible and committed to work and to your job. As an ST, you enjoy to devote time to maintaining traditions and routines at your work-place and in society. You’re interested in power and order and your place in the system. You respect and pride yourself on your ability to follow authority. The ST – the traditionalist, has the gift of being a present-minded and practical. You’re consistent, reliable, and trustworthy. You live by a strong code of conduct. You want people to know that they can count on you. A traditionalist is someone who lives by habit, mindfulness and presence. STs show strong focus in their ambitions and work related goals. You are proud and want to be taken seriously. They seek to build a trustworthy reputation for themselves and spend a lot of time working on their character. They are security-oriented and often become protectors of society, maintaining order and living by the law. It’s important for them to live by a code. It can be hard as a traditionalist to show weakness at times. What do you do when you mess up? What do you do when you’re not as perfect as you want to be? How do you handle if you fail to live up to your duties? It’s important to remember, as a traditionalist, that admitting to weakness or fault can be an important driver of growth and improvement. Don’t try to hide your shortcomings. Which of these temperaments does not exist? Strengths: When at their best, they are clear-headed and steady. They simulate and think ahead. They have focus and direction. They take things one step at a time. They ignore distractions. As a leader, you always starts by thinking about what you want to do, but you don’t always know how to bring your thoughts into the real world. You can come up with plans or big ideas, or you can remember how things were done in the past, and try to advance that. As a Leader, you experience advancing your ideas and thoughts as a stressful but necessary process. You like to think about things, but you don’t always like to do them. You are highly focused on your goals, sometimes to the point where you tunnel vision, but you’re able to plan deep and further than most. Truth be told, you much rather just outline an idea and have others push it forward. And you tend to experience thinking about your idea critically as an uncomfortable or difficult experience. Moments of self-criticism and self-evaluation can make you feel detached and cold. But at the same time, your ability for analysis is exceptional. If you’re ready to look deep inside yourself, you’ll be able to find answers no person has ever found before. Leaders most of all struggle with sudden changes of plans and lack of closure. As a leader, you hate being rushed. You tend to have a set plan of doing things, and it can be hard for you when others compromise this plan. Because of this, leaders spend a lot of time preparing ahead of a situation. You prepare ahead to make sure you are always prepared for any situation. But you can’t prepare for everything, and that’s where explorers and advisors can come to your aid. Don’t be afraid to ask others for help when you are focused on a goal, maybe they can help alert you to unanticipated problems? Like to be warned before a change. Hidden superpower: Driving, pushing, and getting a group past a problem. Weaknesses: Simulating on a problem, thinking ahead, maintaining a goal. The Explorers mental startpoint is the here and now. What’s happening right now? What are people saying? What did I just read? How can I respond appropriately to this? There are different forms of explorers. But what you all share is the ability to think multiple steps ahead, to see and find things nobody else can. Your mind is open and you are able to look wider and in a more perceptive way than most. As an explorer, you know exactly what could go wrong when implementing an idea. You know how well something fits, and how to adjust it to get it to fit better. You often find yourself in the role of someone who alerts others to things nobody else thinks about. Your open eyes can come to great use in many situations. The executive is is concerned with getting the group in line, with making sure everything aligns. As an executive, you want things to follow smoothly according to plan. Is everyone doing what they’re supposed to? Has anything changed? Are things still on course? The executive begins by grounding themselves in the present moment and in their goals and plans. You double-check their schedules and your plans and you make sure you’ve accounted for all that you have set out to do. You often has to spend a lot of time at the drawing table, away from others, doing simulations and projections. You’re able to plan well and to high detail, but you often mention that this mode makes you feel stressed. To an executive, a choice is as good as any. Sometimes it’s better that something happens, than that nothing happens at all. Strengths: Analyzing people’s actions and how things work. Clear-sight. Hidden superpower: Spotting things that most people miss. Weaknesses: Getting things done, getting the group to listen to you, making an impact. The advisor always starts with thinking about the value of things. You think about your life, your situation, your past experiences. You analyze and think deeply about things. Because of this, you often see more than other people. You can give a lot of important feedback, if you dare to open up to others. You can help solve problems in ethics or science that most people don’t understand. As an advisor, you start with thinking, and then, secondly, you begin to look around you. As an advisor, you scan the world through a magnifying glass. If something has your interest, you can study it in greater detail than most. You’re able to look deeply into other people’s stories or into science and to understand it in ways most people can’t. And as an advisor, you may say that this is tedious, talking with others, being around people, and being on the field can bring you a great deal of frustration, but it’s usually worth it, because it can really help you find unique solutions. Neojungian builds its foundation on networks researched in neuroscience. As we have mentioned earlier, there are eight primary networks in the brain. Neurotransmitters drive you to prefer some over others. Warning receptors for example make you use the subjective network, while the speed of breaking down and building up dopamine impact if you like to use the proactive or adaptive control modes. When we feel stimulated and rewarded, the prefrontal regions in our brains begin to flow with dopamine. In your brain, there are receptors that gradually pick up and break down this dopamine. As they do, your interest in a task is gradually decreased. But some people break down dopamine slower than others. A slower COMT and a slower DAT causes you to 1. Build up interest in an idea more slowly, and 2. Lose interest in an activity more slowly. This is all seen in the brain as how prefrontal dopamine is broken down and built up. Judgers can maintain their motivation for a longer time. They experience a higher difficulty in switching to a new task - because they're still fascinated with the old one, and they need more time to cool down in between activities. Perceivers show the quickest breakdown of dopamine. This makes them bore of a task quicker and to soon pursue new activities. It also makes it easier for them to handle interruptions and to voluntarily switch from one activity to another without experiencing as much stress. This is a stimulation-seeking type and this is what we measure for when we measure Perceiving. We believe they are the least likely to benefit from organizing and controlling their life, because their interests are more difficult to predict. They prefer to be in adaptive mode, while judgers prefer to be in proactive mode. Taking longer time to build up and lose interest in an activity. A tendency to make flexible and open decisions. Quick, fleeting interests and an ability to change interests more frequently. Striatal d2 dopamine receptors regulate how you learn from negative outcomes, and how you respond to errors and mistakes. You could call these receptors your self-preservation instinct. Striatal D2 dopamine receptors receive signals from the prefrontal cortex depending on when it is OK to proceed, and when to display caution. Because introverts have more of these receptors, they also tend to be more likely to become cautious when they make mistakes, a reaction that could cause them to become more thoughtful, uncertain and self-reflecting. Our hypothesis is that when we produce these warning signals, the top-down network is activated, making us think more independently on the situation, thinking about how to respond, thinking about what we could to to improve. Because extroverts generate fewer of these stop signals, errors don't make them less likely to trust their environment. They remain in approach mode and they instead use the bottom-up processing to scan for mistakes, listening to feedback from others, and consulting the group on the best next step. How you respond to errors and issues. How negatively you view stimulation. How cool you are under stress. How quickly you can adjust mistakes and bad behavior. are more ready to set aside or ignore small issues when approaching someone. Introverts are more likely to pick up on and reflect on possibilitiesissuesconspiracies when meeting a new person. There is a network in your brain which makes you more aware of the situation, how it feels, and how you experience things around you. This network is called the default-mode network. This network works like a kaleidoscope in making you aware of colors, mental states, and vibes in the room, in social interactions, as well as in art and music. 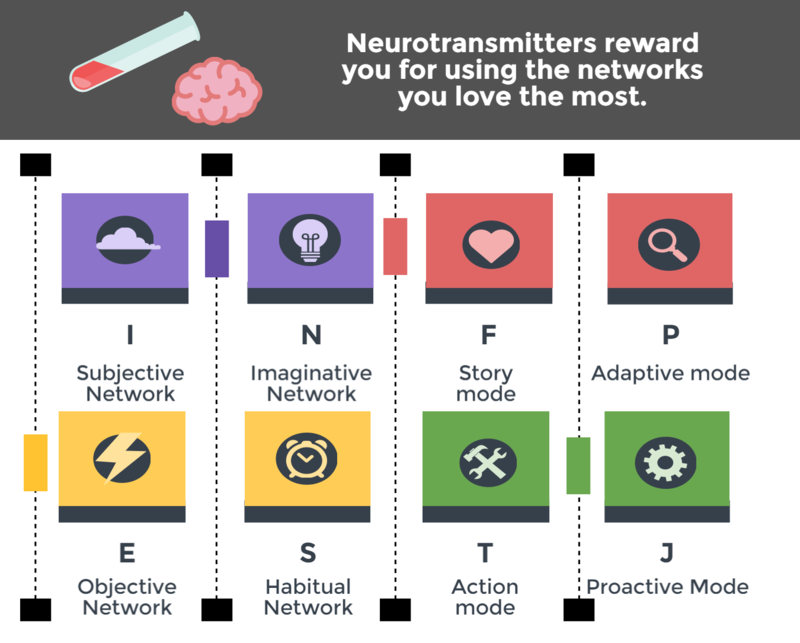 There is an ongoing tug-of-war in your brain between the action mode network and the story mode network. Oxytocin appears to be the primary key to whether we are feelers or thinkers, but the exact relationship is yet to be figured out. You need the story mode network to judge how someone said a word or how green the grass in your lawn is compared to your neighbors lawn. But using this network comes at the expense of another network, the action network, important for organizing, categorizing, measuring, testing, and scoring an activity or experience. The action network relies on factual information to value and order information, for example speed, volume, or quantity. Neuroscience has been clear that when you use one of these networks, activity in the other network sharply decreases. This is why we do not speak of types that are in between on thinking and feeling. The action network helps you use logical or impersonal methods of evaluating things around you, whereas the story network helps you consider emotional impacts and consequences of various choices. But both networks are important in valuing and determining whether an activity is good or bad, or efficient vs inefficient. Which of these statements is the most true for Thinkers? What is the Imaginative network? It is a brain in your network that is involved in rebellious thinking. When you use the imagination network, you're considering alternative meanings to information. You find new interpretations of regular daily occurences. You consider ideas from different angles and in different contexts. You imagine different ways to do things. We believe the imagination network is highly correlated with intuition and your creative abilities. The imagination network is often compared with the habitual network. What we currently know about this network is that the two determine whether you should stick to a decision or whether you should change it around. Just as with the other networks, we believe neurotransmitters determine if you prefer repetition and stability, or if you prefer originality and creativity. Can an intuitive use the habitual network? What definition of the imagination network is better? The imaginative network is involved in daydreaming and belief in fairies.